COMMERCIAL diving has taken Jamie Hardwick to some spectacular places. From off-shore oil rigs in China where he was surrounded by beautiful marine life, to crocodile infested waters in the Northern Territory. But others, he said, were less than glamorous. “One of my first jobs was diving in human excrement at a waste treatment plant in the UK,” he said. “I thought at the time I had to take the good with the bad. Mr Hardwick’s expertise has been utilised in a range of underwater jobs, largely based around shoring up harbours, jetties, slipways, ships, bridges and oil and gas platforms. His move into the industry came after he left the army in 2008. He worked as an inspection diver and welder for various inshore companies around the UK and southern Ireland before moving to across to Perth in 2010. Once in Perth he worked for various inshore diving companies. These days he works with best friend Philip Moore. The pair are partners in Bibra Lake’s Arc Training Solutions, a business offering industry training to local and international subsea companies and individuals. 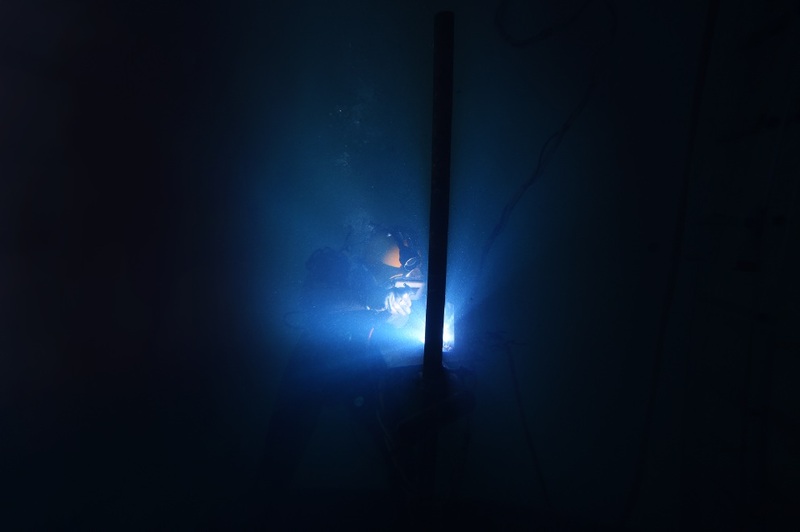 The latest addition to the business is an on-site underwater welding course for commercial divers. “No courses will guarantee you work as a diver, but courses do show employers you’re equipped with the skills and knowledge they require and will make you more employable than the next diver,” Mr Hardwick said. Visit www.arctrainingsolutions.com.au.